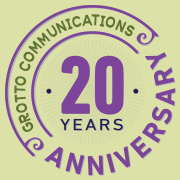 Bite The Bullets: Honing Your Presentation Skills, Part 1 | Grotto Communications Inc. If you find yourself standing in front of a group of people with a big screen over your shoulder, you will probably find the experience more gratifying for everyone involved if you feel more confident about your presentation skills. Build that confidence by honing your message and keeping your PowerPoint deck — or any other tools you use — clean and simple. 1. GETTING STARTED: Clarify your goals for the presentation. What do you want people to get out of your talk? How much time do you have or do you need? AUDIENCE (WHO): Make notes about your anticipated audience to hone in on their needs and come up with the best way to reach them. Are they coming from the same place? Do you need to allow for different levels of knowledge about your topic? MESSAGE (WHY): Boil it way down and define your goal. DON’T DO THIS PART IN POWERPOINT! Step away from the computer! If you had to speak extemporaneously on your topic right now, what would you say would be the most important points to get across? Jot down your main points. Then, maybe, start typing. TOOLS (HOW): Don’t forget to get some of the basic housekeeping pieces settled before you get too far with your planning. Remember to question whether or not an electronic presentation is really necessary. If a white board or chalkboard would do, don’t rule that out as an option. 2. CRAFTING YOUR STORY: Develop a creative way to tell your tale. Next, organize the main points of your message and see how they can flow together. Be concise and find the best way to get your message across in clear, active language. IMAGES / PHOTOS: Use expressive, royalty-free graphics to illustrate each main point. Your onscreen presentation should never duplicate your talk or provide all the data. It should support the main points with simple, evocative illustrations. Consider the “Squint Factor” when deciding which charts, graphs, or data to include. TEXT: Use active verbs and full sentences. But keep those sentences tight, a maximum of 2 lines in the headline or first sub-header text size. Add category slides to break up the piece. TRANSITIONS: If your presentation is to be less than 15 minutes, then transitions may just add unnecessary clutter. Use the animated feature very judiciously. A simple fade in and out is sufficient. Use the same effect for similar level situations. Stay tuned for Part 2 with tips about connecting with participants and resources.